The Mission Aqueduct Needs Help! The Mission Padres and Indians built the seven-mile long aqueduct around 1805-15 to bring water to the Mission. Over the years weather and development have destroyed most of it. The primary remaining segment is located on Canada Larga Road. It is about one hundred feet long and seven feet high and five to ten feet wide including the supporting buttresses. The Ventura County Parks Department owns the site. The site was purchased in the Seventies to prevent destruction. County Parks maintains the site with a fence, weeding, security and grading. The Mission Aqueduct in the Ventura River Valley is in need of long-term weather protection. The Mission Aqueduct is one of the County’s oldest and most valuable Landmarks (No. 28), State Landmark, and National Register site, and one of the very few recognized by all three government levels. The El Nino and 2005 rain storms eroded the site bringing the nearby creek closer, destroyed the protective fence, and tipped the front segment of the Aqueduct on its side. As a result of the storm damage, the Ventura County Cultural Heritage Board created the Mission Aqueduct Task Force to study and make recommendations that assure the long-term viability of the site. The membership is open to any interested person. The Task Force examines physical, jurisdictional/support, and documentation problems of the Aqueduct. In early 1999, Robert Lopez, a Moorpark College Archaeologist, his students, and Task Force members led a site walk of the entire seven-mile length of the Aqueduct to record the route on topographic maps and to find any remaining segments. Additionally, members of the Task Force photo documented the site and the County Museum created a bibliography of the known materials. The Task Force has acknowledged that the long term protection from downstream bank erosion remains the primary concern. Our primary objective is to obtain $10,000 for an engineering feasibility study to find a bank erosion solution. Additionally, most seem to preliminarily agree that a permanent, protective roof is also needed. This might also include very limited site development with several parking spaces and more educational materials. This would also require substantial protection of the structure from vandalism. Recent Activities: A sign has been added to the site giving minimal historic context. At our request, Caltrans is about to install signs on Highway 33 directing the public to the State Landmark. Other important changes include a regrading of the site to divert rainwater, rebuilding the fence, and temporarily installing “J” rails in February 2008 due to a pending major storm. The Future: All of the site protection steps will require funds not presently available. Therefore, donations are being sought to assist in preserving this important vestige of Ventura County's, California's and the Nation's history. If you feel so inclined please call the number at the end of the newsletter about where to direct a donation. Further reading: There are several fine studies that have been done over the years that are open to the public. The San Buenaventura Mission Aqueduct at Canada Larga is a significant structure in both Ventura County and Western American history. The magnificent waterway is among the most interesting landmarks on the Pacific Coast that was left to us as a legacy by the California Mission System. The remaining aqueduct at Canada Larga survives as a small but significant portion of the extensive San Buenaventura Mission Water System. The historic data surrounding the development of San Buenaventura Mission point to an aqueduct construction date within the years 1805 and 1815. Mexican artisans (stonecutters and stonemasons) forever changed the appearance of California missions. Imported by the Spanish government in 1770 until 1800 to serve as laborers and instructors to the neophyte Indians they imparted enough skills to the neophytes to do masonry construction which flourished throughout the California mission system. 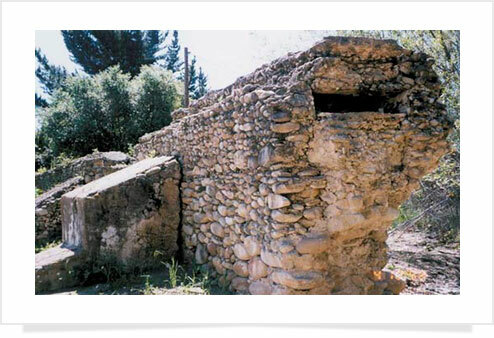 the Mexican artisans imparted enough masonry construction skills to the Indians The dexterity and agility of the Chumash Indians combined with the skills learned from the Spanish artisans created the elaborate seven-mile aqueduct running along the Ventura foothills. Without a permanent water supply, the San Buenaventura Mission community could not have survived. The composition and style of the aqueduct at Canada Larga, like other raised mission aqueducts, reflects missionary interest in traditional architecture. It, like the mission, testifies to the influences of Marcus Vitruvius Pollio (First Century B.C. Roman architect and engineer), and the importance of classical architecture in the world of Spanish California. The remaining aqueduct represents an impressive technical accomplishment of the early California water system. The aqueduct served the mission and community from the time of construction until the system was destroyed by the floods of 1862. 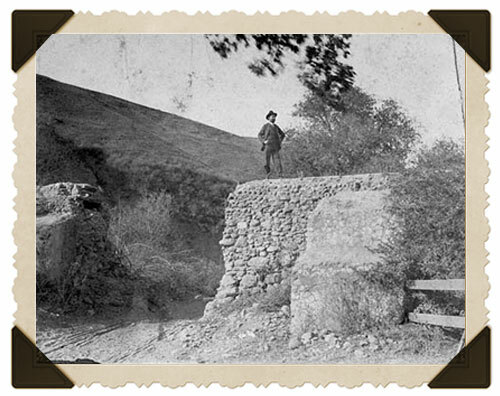 There is little doubt that this aqueduct ruin constitutes one of the oldest man-made structures in Ventura County. The local landmark is a prime example of the various cultural influences that built the great state of California. There are other segments of the aqueduct that are underground further to the south toward the mission. Time and the elements have destroyed much of this structure. Nevertheless, much of the destruction has been accomplished by man’s development of the area during the last sixty years. The San Buenaventura Mission and the mission reservoir, where the aqueduct ends, are registered by the State Historical Resources Commission as California’s Historical Landmarks No. 114 and 310, respectively. The longevity of the Canada Larga Aqueduct, and the engineering skill it establishes it as of historic value to California mission life, and an educational resource worthy of further interpretation. In 1781, Governor Neve supported the founding of Mission San Buenaventura. On March 31, 1782, Father Junipero Serra established it as the ninth California mission. In the early stages of the mission settlement, crude unlined channels made of timber and tule provided water from the nearby river to fields immediately surrounding the mission. The early development of Mission San Buenaventura typifies the formation of the first five missions built throughout California. The first mission was destroyed by fire. Building began on the new masonry structure in 1792 and was completed in 1809. The elaborate seven-mile aqueduct built by the Chumash Indians between 1805 and 1815 began at the Compardo Lago and terminated at the adobe reservoir behind the old mission. The aqueduct is made of cobble stone and mortar (random rubble). The walls are supported on both sides by two massive buttresses that are six feet wide and ranging in thickness from 4-1/2 to almost 7 feet. The remaining structure consists of two masonry supports, which total an approximate length of 100 feet. A 12-foot gap between fragments resulted from a turn-of-the-century blast to create an opening for a road. The portion to the is approximately 20 feet long. The larger fragments are about 70 feet long. The height of the aqueduct ranges from 10 feet at the northwest end to under 2 feet at the southeast corner. At Canada Larga, the aqueduct was a covered system. The channel at the top of the structure is approximately 10 inches deep and 30 inches wide. At other sections along the foot of the hill, there are several remaining portions of the acequia (Spanish for irrigation ditch) masonry still intact. Some undisturbed sections are covered at present by a thin layer of soil. There are other small acequia sections found to the north where the aqueduct had been built along the steep slope of the hill. The downhill side of the trough has broken away from the main body. In some places that have fallen down, the uphill side remains. In some areas, the broken sections have not been found. The acequia sections were merely open lined ditches of unmortared stone, brick, or mortared stone of brick. One acequia was discovered by Gessler in 1968 within the compact soil of the hill, around which the water flowed to the aqueduct at the Canada Larga. The small sections that were found are owned by several private citizens and the City of Ventura. It can be assumed that there was at least one point of takeoff for irrigation water along the seven-mile route, and there could have been more. No evidence of other reservoirs was found during the 1974 archaeological survey on the Mission Water System. Issue Statement: Specific base documentation of the physical problems affecting the site is lacking, i.e., an engineering survey, etc. Historical information available to the general public is lacking, i.e. school level educational material and complete archaeological data. Issue Statement: Interests in the Landmarks are varied: the Aqueduct is a County Landmark owned by the County (administered by the General Services Agency-Parks Division), but is close to the City of Ventura and part of the San Buenaventura Mission historical complex. Also, the National Register site designation for the Mission includes the Aqueduct. Historical societies, the adjacent property owners, and the Chumash are crucial participants in the creation and discussion of any solution. Problems affecting the aqueduct will only get worse and now is a good time to rally individuals to create innovative solutions. Coordination with all concerned parties is important because it is a historical site of concern to all citizens of the area.